Prop gun rentals in Canada. In The Shadows has 7600 guns in our collection. Blank firing, rubber, resin, Airsoft and actual working rifles and hand guns. We carry a variety of machine guns (heavy machine guns and sub machine guns), as well as hand guns, shotguns and rifles. We rent prop guns across Canada. We have hundreds of police pieces in inventory. Authentic police uniforms for FBI, NYPD, NYPD SWAT, Ottawa Police, RCMP, Metro Toronto, Calgary and others. We stock multiple uniforms (and a variety of ranks) for each of the previously mentioned police forces. We also inventory thousands of authentic flashings for a variety US and Canadian police forces. We carry $35,000,000.00 in prop cash. 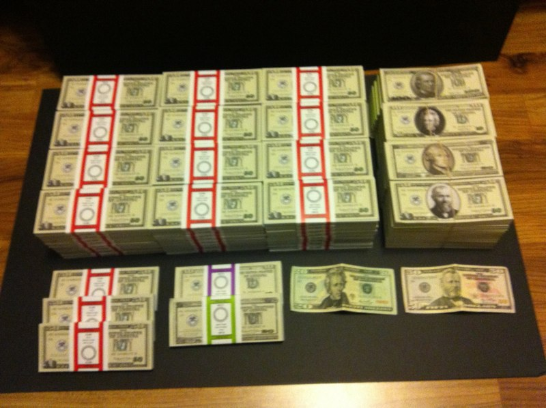 Our "USA LOOK" custom designed fake cash has been used in many motion pictures, and theatrical productions. We have over 50 safety features in our custom artwork. Each bill is two sided, and approximately the size of USA currency. We have $100.00, $50.00, $20.00, $10.00 and $5.00 denominations. We rent pro prop “fake" cash, or money in the Toronto area. We sell around the world. Many other props and accessories including bank wear, computers, gold bullion, dummy coins, forensic paraphernalia, night vision goggles, black powder guns, barrels, skulls, bear traps, custom designed props, and many others are available. All items in our inventory are not displayed on our website. Please contact us with your needs and a specialist will work with you. When our team is on set, we acquire authentic signatures, and photo promotional materials. We also attend many events such as Fan Fest, Fan expo, and many others to acquire autographs. We also buy, sell and trade authentic signed items. Our collection is extensive. Our collection includes many signed pieces from James Bond, Star Wars, X-files, CSI Las Vegas, and many other major motion picture and television franchises. Our art department creates custom props and print work. See about-us for more information.